Nortje got a chance to bowl alongside one of his icons Dale Steyn at the Cape Town Blitz camp in the MSL T20. While the focus remained on some big names like Yuvraj Singh, Carlos Brathwaite and others, a 25-year-old fast bowler from Uitenhage in the Eastern Cape triumphed big time in the recently concluded IPL auction. 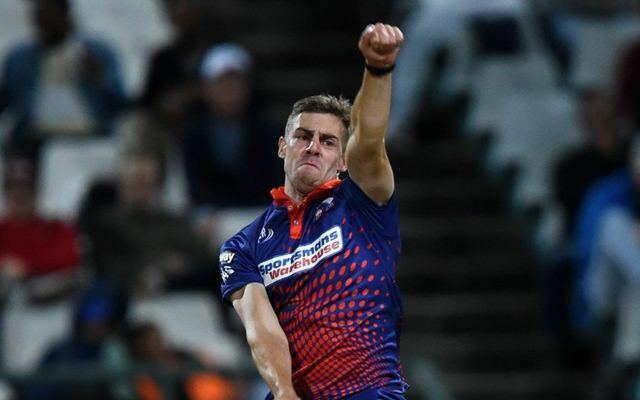 Anrich Nortje, the Proteas quick, will be representing the Kolkata Knight Riders in the upcoming season under his country legend Jacques Kallis. Nortje impressed many during the Mzansi Super League by hitting the 150 kph mark on a regular basis and picking some big wickets. The 25-year-old is currently not playing any cricket after getting himself a minor surgery on his ankle. He revealed how he spent the auction day and how perplexed he was to learn that he got picked up. Explaining to ESPN Cricinfo, he said that he was in a meat shop to buy meat for a braai. Braai is an Afrikaans term which refers to grilled chicken and is famously known as barbecue in other parts of the world. He was apparently informed about his selection by a phone call and was totally elated with the turn of events. “I was busy getting meat for a braai that night. I didn’t really expect to get picked up, but I thought, well, definitely give it a shot. When I get on the shortlist I was quite happy. I was in Struisbaai, [a picturesque coastal town of a few thousand people] in the Western Cape, just in a shopping center when someone phoned me and I heard,” Nortje explained. Nortje got a chance to bowl alongside one of his icons Dale Steyn at the Cape Town Blitz camp in the MSL T20. In his first game, he picked up a four-fer and picked up four more wickets in the next two games he played. An injury sabotaged what could’ve been a memorable campaign for him, but that little cameo was enough to earn him a Rs. 20 lakh bid. “It started with getting selected for SA A, and then just bowling straight through the winter. I had a lot of cricket, a lot of prep, a lot of bowling. It’s been very busy and very exciting. Getting selected for the MSL was also a great thing. It got people looking my way a little bit. It would have been nice to play a little more, but it was still a great opportunity,” he said.